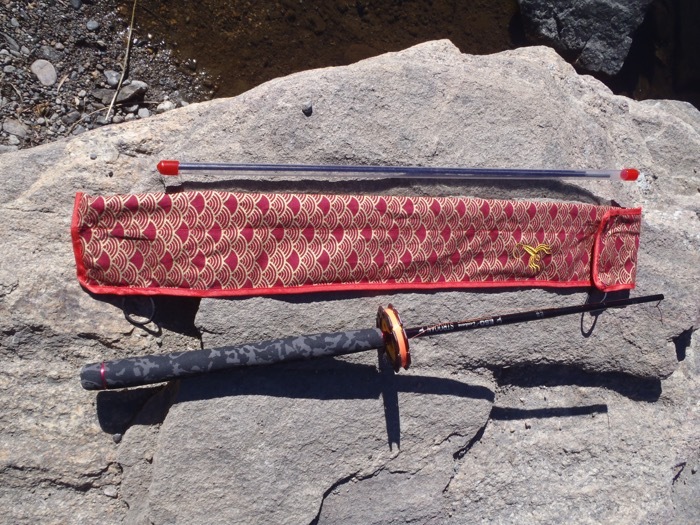 Zoom rods are becoming more and more popular in tenkara these days due to their versatility and their ability to “dial in” the action to one’s liking. 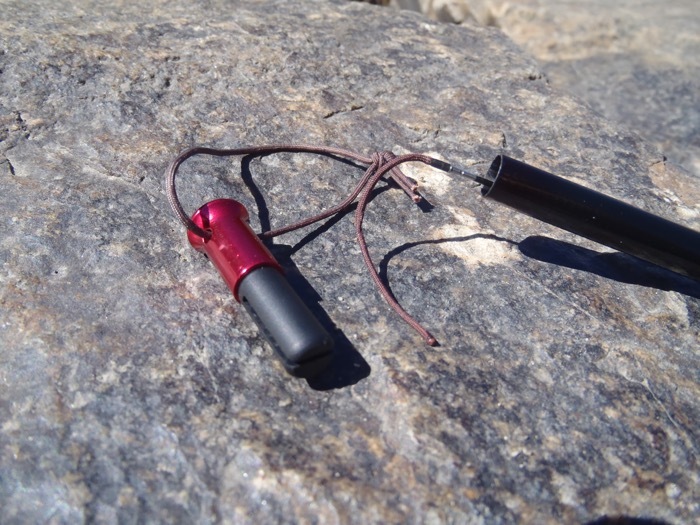 They’re versatile because they can adjust from one to two or three different lengths allowing you to reign in the rod tip in tighter quarters, and then “zoom” the length out when you need a little extra reach. And their action is “customizable” in the sense that the different lengths change the personality of the rod by redistributing the mass and flex points to pander to each individual casting style. 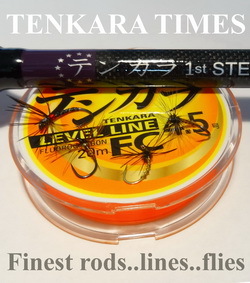 On any given zoom rod, some will prefer the first or second positions, while others will prefer the second or third. It’s all a matter of courting your personal cadence. Many zoom rods (especially double-zoom rods) only vary mere inches between their longest and shortest positions and don’t really make a significant difference in terms of diminution vs. reach. But with a span of nearly a yard, the Strooan does. Not only that, but somehow, it doesn’t feel tip heavy when extended out to the longest position which (in my experience) seems to be the Achilles Heel of zoom rods in general. 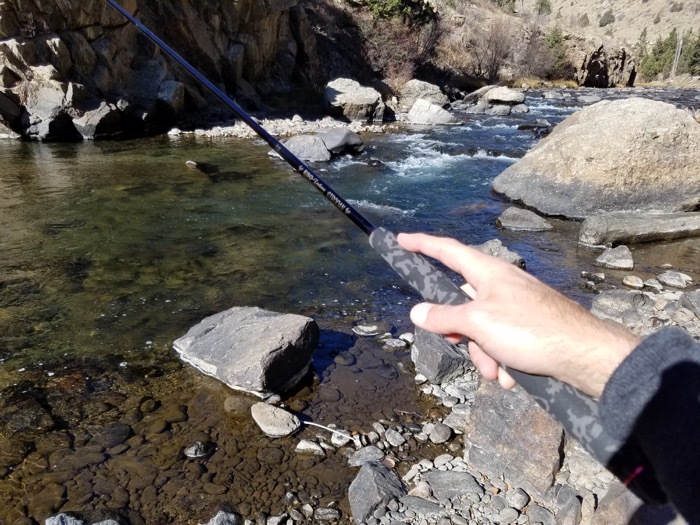 Instead, the rod is a pleasure to cast even at the full 12′ length without adding any fatigue to the arm or wrist (though I still prefer the shorter first and second positions because of the slightly softer action and haptic feedback). 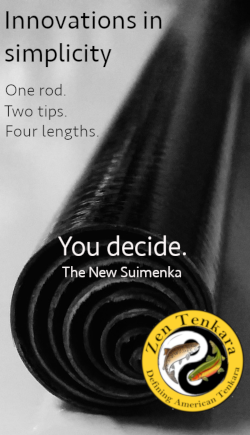 Whatever your casting style, I think at least one of the three lengths would put a smile on the face of any tenkara angler. All the actions are responsive, with good recovery, little tip bounce, and are very intuitive. 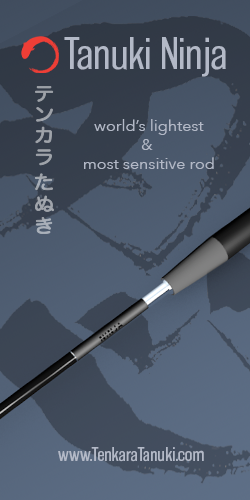 As the company’s name suggests, this rod is a little different. There are a few unique features and standard add-ons that you won’t find with many other manufacturers. One is that it ships with a spare tip set. Many manufactures offer aftermarket replacement tip sections, but by the time you need to order them, it’s already too late. I think it’s a nice touch that Esoteric Tackle automatically includes them to give you an insurance policy before you actually need it. 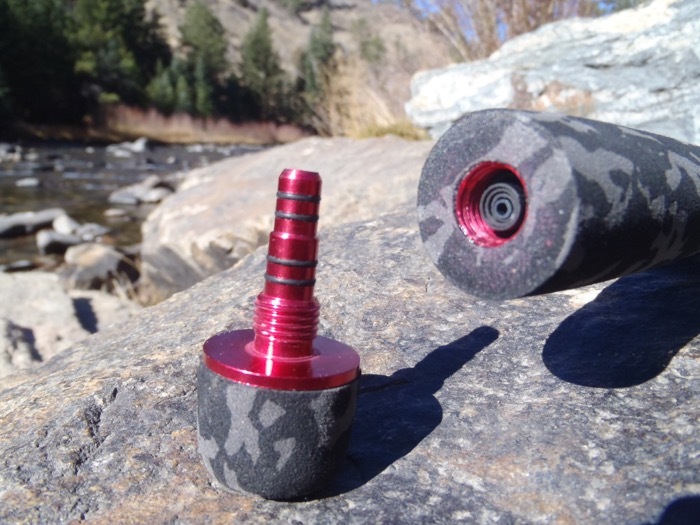 Speaking of the grip, the handle on the Strooan is a durable EVA foam that is slightly contoured to give you good purchase on the rod regardless of your style. 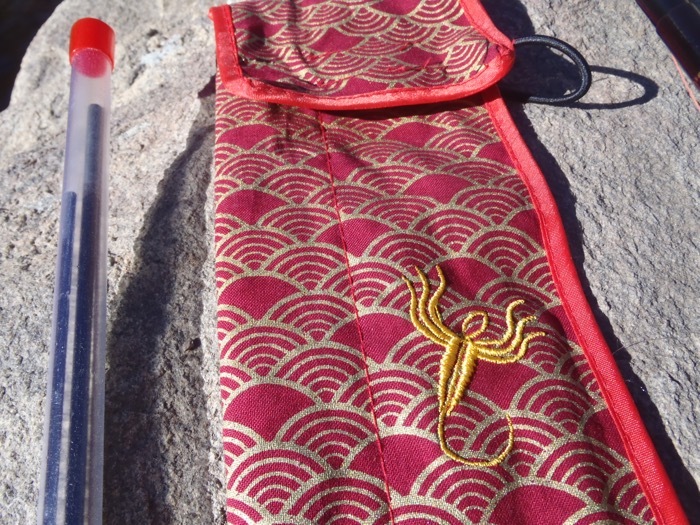 It’s a subtle camouflage pattern which seems to be fashionable in the tenkaraverse today. One might argue that the camo adds stealth, but that would be betrayed by the glossy finish on the blank. If stealth were the goal, then a matte finish in combo with the camo would make more sense. It was probably more of an aesthetic choice. Either way, I could take or leave the camo grip–though given the recent sentiments on Facebook, many people seem to gravitate towards camo foam. I like this rod and I’ve had the pleasure of reviewing several other products from Esoteric Tackle in the past. 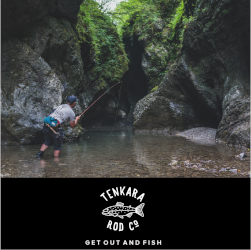 I know they’re an authentic company with a true passion for tenkara and good design. And the Strooan definitely confirms that dedication to me. It’s a great all-around rod for 90% of small to mid-sized trout or panfish, is high quality, fun, and has a bunch of nice bonuses others don’t offer. What more could you ask for? 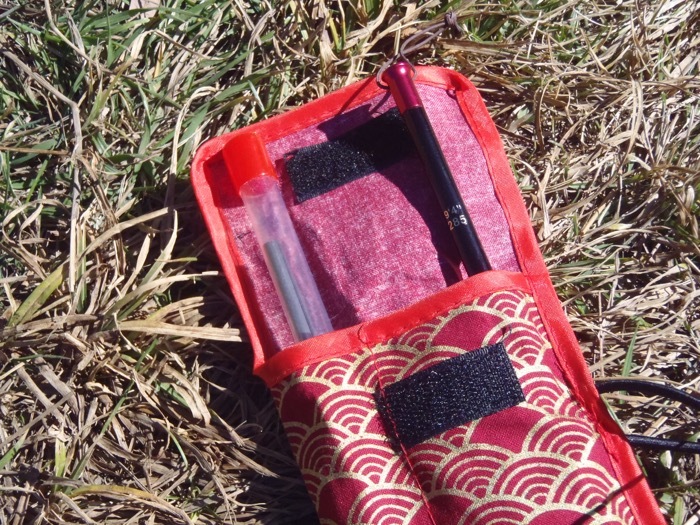 Please tell me of your experience with shipping costs and time frame from the UK to Denver. I was looking to order some indicators but I was shy to pull the trigger due to the fact they are 1/3 of the way around the world. 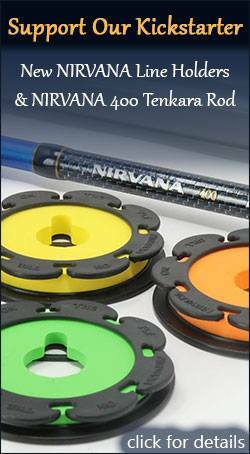 All rods are shipped with a tracked service to the UK, Europe and USA. The time can be variable depending upon now busy customs and excise are. However, with the insured tracking you can be assured the rod will reach you. You can even use the tracking to poke your local post office to see where it is. Experience suggests this sometimes prioritises the passage through customs. Thank you for a great review Jason. Very pleased to hear you enjoyed the rod and the additional details. Esoteric Tackle are continuing to work on new products for next season. What kind of action does it have? What lines do you think match well with it? 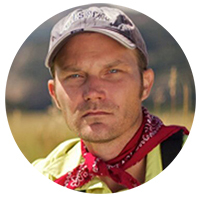 Hi Adam, “how” it casts is going to be subjective but I like the action. In the 2 shorter lengths it feels a little softer giving good feedback like I mentioned above. Because of this, the rod does most of the work for you since it loads and recovers easily. I mostly fished it with a 2.5 line because that’s what I typically fish with. But I’d say the rod works well with a 2.5-3.5. Probably 3 is the best all around sweet spot. Cool! that’s one fine looking Rod you have there!